Three Little S'mores went to Owensboro on Friday. We met four more there. "Who are the S'mores? ", you ask. In some areas you might call us a bee. We are 20 strong. Sisters I never had, BFFs, sewing assistants, and critical supporters. "Why are you called S'mores? ", you inquire. Because when we're together we want to sew s'more, laugh s'more, eat s'more, and buy s'more fabric. "Why Owensboro? ", you ask yet again. Because three of our S'mores live in northern Kentucky and southern Indiana. 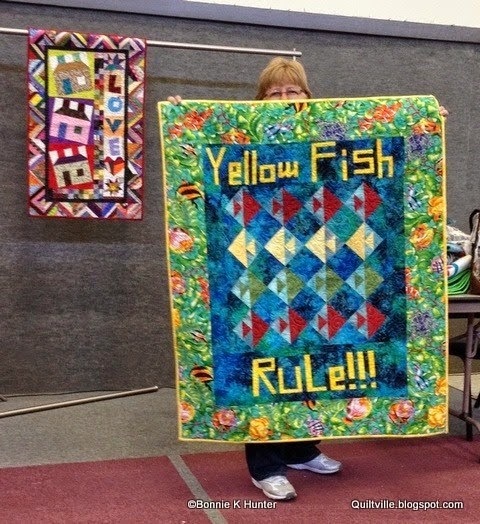 They belong to the Owensboro Area Quilt Guild and their biannual quilt show started Friday and continued through Saturday. For a guild show it was very professionally presented. The area on the bottom left was for lectures and demonstrations. Bottom right and right aisle were a nice variety of vendors. And at least 350 quilts were hanging. Including two of mine!! And quilts by other S'mores. Mr. Whittle was vending. I shopped with the sole purpose of getting a back for French Braid. So I came home with 3 yards of 108" backing fabric to add to my stash report. I also bought a spool of Aurifil at a great price from another vendor. All-in-all, it was a lovely day with lovely friends. See how others measure up at Patchwork Times. Actually, No-Time for a Tip on Tuesday. As I work, I'm always thinking about the way I do things -- is it easier, does it make sense, could it help a newbie, am I the only one... While a couple of tips have been mulling around in my mind, I haven't had time to take pictures. Visits from family trump blogging any day. What can I say? I'm linking up with Connie at Freemotion on the River today to show my progress on Mary's Triangles before it outgrows my design wall (and before y'all get totally tired of hearing about MT). Anyway, I have decided to group the blocks by triangle color since I had several fabrics in my starting group that were in coordinating colorways. And also because my brain just requires a semblance of organization, even in a scrappy quilt. I can't help it. It's me. Since last reporting I have added a round of rusty rose triangles. Rather than continuing with this scheme for the rest of the quilt, I am considering some different settings for the corners. The beauty of MT is the variety of setting options. Basically, anything that works for HSTs or log cabins will work for MT. Judy Martin's log cabin books have been a great inspiration. I'm hoping to get the center rows together this week as I think this is as wide as it will be. Thanks for visiting today. And come back soon. MT ... not empty, but M T for Mary's Triangles. Not sewn together yet; I can still change things around, but I'm pretty happy with what I have up there. The picture doesn't do it justice. The accent squares really sparkle. Current plan is to alternate medium and dark rounds. Since I started with a roll of 5-1/2" strips from a Thimbleberries collection, I have a lot of similar colors so I'm trying to keep the like colors together. The outer rounds might be a little more varied. Or I might do something different in the corners. In the meantime, check out other design walls at Patchwork Times. It's not that I have not been sewing. In fact, I've set myself a goal of at least 20 Mary's Triangles each day. Some days I've made more. The quilt is coming along nicely now that I have settled on a setting with a star in the center. I'll post my progress tomorrow. But my Main Man was out of town most of the week and the grandkids arrived on Wednesday. Not much time for sewing, and that's OK.
... we had a Sedate Saturday. CG and I headed over to Cheekwood Botanical Gardens to see giant bug sculptures nestled among the plants and flowers. All were made from wood, primarily willow and red cedar -- scary and lovely at the same time. CG is a born naturalist and she especially looked forward to seeing the dragonfly and the assassin bug. My favorite was the praying mantis. Did you know the plural of mantis is mantids? I didn't. There were interactive areas, as well -- the butterfly and the hive. And an amazing sculpture of nothing but intertwined twigs. We in Nashville are so fortunate to have a place like Cheekwood in our midst. I'll admit, it's been a while since I had visited -- which is silly since we now live about 3 miles from there. The gardens are magnificent, full of winding walks and water features, something always in bloom. I paid for an annual membership and plan to go back frequently to walk. Two hours of hiking the trails through sun and shade, uphill and down, and I was wasted so CG and I came home for lunch. Son2 and AA were not far behind. Son1 joined us for dinner. A spirited game of Phase 10, fix-it-yourself personal pizzas, and a raucous game of Farkle rounded out our day. All the while World Cup soccer, golf, and CWS baseball (GO VANDY!!) going in the background. This family loves its games! Calm has fallen on the household once again. I won't know how to act! Kids! What ever happened to Lincoln Logs and hide and seek? Today it seems a thing has to be electronic or glow in the dark to be fun. So yesterday we were off to Glow-Golf. Gotta admit, it was fun. Though I was a bit concerned about this old lady tripping in the dark. However, I wasn't brave enough (or limber enough) to try out the Laser Maze. They both did very well avoiding the laser lines. Son#2 and I watched it unfold on a video monitor. We wrapped up the day with a 3-month game of Pay Day. I was able to give these kids a real hug and spend some quality time with them over a game of Kings in the Corner after dinner. They will have time with Uncle Brian and Aunt Sherry today after a trip to the wave pool. Can't wait to see what's on the agenda for Friday. More games, I'm sure! At most quilt shows the requirement is for a 4-inch sleeve to be attached to the top of the quilt. And in many cases that full 4 inches is needed, especially if PVC piping is used. In those cases, though, if you have stitched the sleeve flat to the quilt the top edge of the quilt will be distorted by the pole. I have discovered that adding a tuck in the sleeve relieves that distortion. Generally, if I fold the sleeve up to the edge of the binding, that is sufficient. I happened to be adding sleeves to a couple of quilts today so I took some quick photos. I hope you can see what I did. You may notice that I have basted the sleeve to the binding because it is temporary. When I know in advance that I want a permanent sleeve, I would stitch it in when applying the binding. I also make my sleeves from a tube to protect the back fabric. That little bit -- no more than 1/2 inch of "give" -- makes a world of difference in how the quilt hangs from a pole like those supplied by display companies. I'll do my best to get a photo of these quilts hanging in a couple of weeks so you can see what I mean. My design wall is an indication of my preoccupation this past week -- Mary's Triangles. As I said yesterday, my intention was to make this a leader-ender project. Yeah, right! I now have the combo units made and paired with the large rectangles -- enough for 160 blocks, 42 of which are already made! At the end of the my tutorial I mentioned that the accent squares could be replaced with half-square triangles for a more complex look. Imagine my delight when Bonnie Hunter provided an illustration of that on her blog Quiltville's Quips & Snips the next morning! Take a look. I don't know how she made them (or if she was the one who made them, for that matter), but those fish are Mary's Triangles!! Aren't they fun?? If you missed my tutorial for Mary's Triangles, you can read it here. Bop on over to Patchwork Times to see what everyone else is working on this week. My week got off to a rocky start -- under-sleeping, printer woes -- but improved greatly as the week progressed. Nevertheless, no finishes to bring my stash numbers back into focus. Nothing in, nothing out. Most of the sewing this week was devoted to working up samples of Mary's Triangles for a tutorial I posted on Wednesday (and updated yesterday and today). As frequently happens, little tasks inspire me for greater things. So now I have a pile of pieces, though intended to be leaders and enders, which have morphed into pieces and parts for a whole quilt of Mary's Triangles. Does this ever happen to you? I've tried doing the leader-ender thing, but I get antsy to see what things will look like and kinda get in a rhythm of chain piecing and the next thing I know all the pieces are made! Obviously, I have no self control ;p !! The rest of my sewing time this week was devoted to turning bindings on three quilts, two of which will appear in the Greater Owensboro Quilt Guild show in a couple of weeks. I'll post pictures from the show. I still need to make the sleeves and that will give me some fabric usage. Today I'll be linking up with Sarah at Confessions of a Fabric Addict for her Whoop-Whoop Friday because I have something to celebrate! On Wednesday I wrote my first tutorial: "Fun with Mary's Triangles". Mary's Triangles (so-named by quilt author Sally Schneider) are "group-project friendly" because they can be trimmed down to a consistent size without losing any detail. And "scrap friendly", too. Both are things that folks working on comfort quilts like to hear. While my photos could be a little better, I think I did OK. I'd love for you to try it and give me some feedback. Please check it out here. Have a great weekend. And hug all the fathers. PS: I've been working out alternate sizes in my head, but need to check the measurements in real-time before I publish the numbers. Updated tutorial 6/14 to include new numbers. Sally Schneider, author of Scrap Mania and several other books on managing your scraps, came up with an easy method to make these composite triangle squares that she calls Mary's Triangles (it's a long story ....). I'm sure others have come up with a similar concept for different sizes, but this is where I learned it and the size I use. These blocks finish at 4 inches and are constructed with 1/4" seams. Updated 6/14/14 to include additional sizes. Cutting for 5" and 6" blocks, respectively, in parentheses. one dark rectangle 4-1/2" x 5-1/2" (5-1/2" x 6-1/2", 6-1/2" x 7-1/2"). Begin by sewing the accent squares to the short side of the light rectangles. Press toward the accent square (I finger press). These units should measure 2-1/2" x 5-1/2". Position the two units, right sides together (RST), with the accent squares on opposite ends. Stitch along one of the long sides, feeding the accent square end under the presser foot first or your units won't look like mine (ask me how I know ;-} ). Clip the seam about halfway between the two accent squares. Don't be afraid of clipping too close to the seam because it will be cut away. Press away from the squares (I use the iron at this point). This unit should measure 4-1/2" x 5-1/2" . Position the right triangle ruler so that the base of the triangle is aligned with the bottom of the pieced unit and the point all the way to the corner. The angled edge of the ruler should fall on the seam intersection. If it doesn't, adjust the position so that it does and draw a line. Line drawn -- should have been a little more to the left! Or use any ruler with a 45-degree line positioned along the bottom edge of the unit. The ruler needs to be long enough to extend to the corner and the edge should fall on the seam intersection; if it doesn't adjust accordingly. Turn the unit around and repeat on the other side. Place this unit on top of the 4-1/2" x 5-1/2" dark rectangle, RST. Stitch just to the left of the drawn lines, trying to be about a thread's width outside the seam intersection. Cut apart between the stitching lines. This seam will be slightly larger than 1/4". Press toward the dark triangle. Trim if necessary; however, if you have stitched accurately all you should need to do is snip the one dog-ear. These blocks should measure 4-1/2" unfinished. Mary's Triangles can replace half-square triangles in any setting -- furrows, sunlight and shadow, diamond, etc. Also, the accent square can be replaced with a 2-1/2" half-square triangle for a more complex look. I hope you will give this a try. And be sure to let me know how you do! Both of these gadgets are for holding pencils at a computer station. I will say the blue knobby thing doesn't hold much more than a pencil, but it's so nice to have a pencil at hand to make a quick note about what you are doing or to draw that line on a square -- you know the ones. The green thing is soft and flexible so it will hold a seam ripper. I have one on my travel machine to hold a small pair of scissors. And I have one on my tablet to hold the stylus. The office supply store is a great source for storage containers. I absolutely can't function without these "Really Useful Boxes" (truly, that's what they are called) in all sizes. The small ones are great for pins, bobbins, and clips. The latches keep the lids on to prevent spilling. And they stack! and come in such fun colors. It's Monday. It's raining. And it's guild meeting day. So I headed down to the computer to write up instructions for today's guild program. Just one block ... how hard can that be? Well, harder than I thought. Especially since my printer is on the second floor and I'm in the basement. Rather than run up and down two flights of stairs to turn on the printer and then back up and down only to find out WiFi couldn't broadcast that far, I had the bright idea to e-mail it as an attachment to myself and I could receive it on MM's computer in the basement and print there. Not to be. E-mail didn't like something in the document, wouldn't attach. Did I say it's Monday? And it's raining. Why do I always wait till the last minute????? I ended up copying the text into a message and was able to print that. So what am I working on otherwise? Today at guild sit-n-sew I will be turning the binding on Rock Island, Rock On (a/k/a Rock Island Campfires). As I was sewing the binding strips together I was reminded of a tip I got in a class -- I think it was Susan Cleveland (Piping Hot Curves). So I thought I'd share it with you. You probably know that the seams on binding strips should be on the diagonal to reduce bulk. This is accomplished by putting strips right sides together at right angles to each other. Then stitching diagonally across the intersection. But do you have trouble remembering which way to sew? Think about the strips as the legs in a pair of pants. Got the picture? ALWAYS stitch along the waistline, NEVER through the crotch! ... chaining till I have them all together. Hope your Monday got off to a better start than mine. Check out what others are working on at Patchwork Times. What a week! It's so nice to have an extended obligation-free period of time to concentrate on some much-needed reorganization. If you missed my Adventures in Cleaning, just scroll back through the last week of posts. In the meantime, the cutting table is finally clear. The sewing table is finally clear. Yesterday I cut the binding for "Rock Island, Rock On" (a/k/a/ Rock Island Campfires) using about 1/2 yard of fabric. Small progress, but it's a start. I will be taking a box full of old magazines, some sewing room accessories, and several yards of fabric (previously counted out) for the freebie table at guild tomorrow. I am definitely in a de-accessioning mode, can you tell? Linking up with Judy at Patchwork Times. After a week of Urban Renewal and Adventures in Cleaning, not only can I SEE my sewing table, but it's clear enough to sew a binding on "Rock Island, Rock On" (a/k/a Rock Island Campfires). Since I will be entering it in the Owensboro Quilt Guild show at the end of this month, it's critical I get that taken care of. Bright and shiny and loaded with FQs. Kinda messy at this point. I need to figure out a fold that fits the space, but all those plastic bins are now empty as is the shelf they were on. The bagged projects are temporarily going back on the shelf so that I can cut the binding for "Rock Island, Rock On." So while I'd rather it be a Scrappy Saturday, I'll spend a bit of time cutting and sewing. The binding handwork will be perfect company while watching golf this afternoon. You bet, I'm doing a happy dance today! GS#2 is bringing a girl friend home to visit in July. Should I start a new quilt??? GS#3 graduated middle school with all As and perfect attendance. I'm sure his little sister did just as well -- she's heading off to middle school next year -- but no one tweeted about her .... sigh. And the new cabinets fit perfectly under my layout table! I am, indeed, a HAPPY GIRL!! Linking up with Confessions of a Fabric Addict.